Create a project budget based on the estimated number of hours. This type of cost estimate is created before the project is executed. It’s calculated by multiplying the Estimated hours that will be spent on the project by the Client rates that you invoice. Client rates are always associated with a particular activity or role. These activities can include project management, analysis, graphic design and others, while roles can include project managers, senior designers, art directors and more. Add or choose your preferred activities or roles in the 3rd step of creating a project. 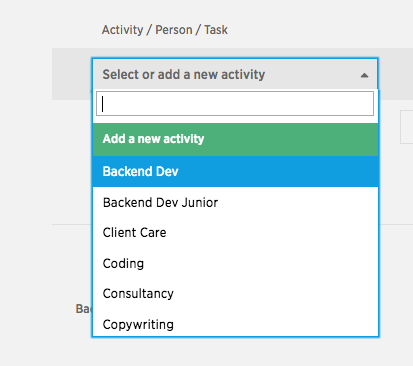 Define the hourly rate that you invoice the client for the activity or role. 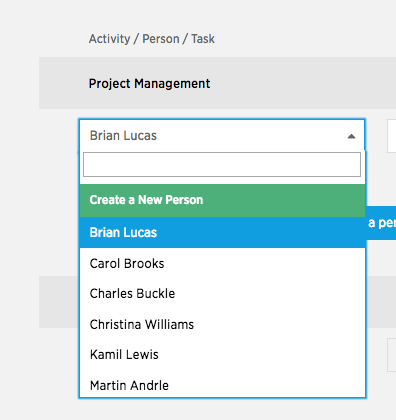 Add or choose the person to assign the selected activity or role to. Enter the Estimated hours that you have agreed on with the client. Now you can see how much you’re going to invoice the client for this activity. Costlocker allows you to make cost estimates on the level of individual tasks. However, it’s only possible when all of the tasks within a single activity have the same assigned client rate. If you want to charge different rates for the tasks that would normally fall under a single activity, it’s easy – just create separate activities per every rate. The same applies for a person, who executes different activities with different rates on the same project. There can be any number of people added to any activity or role. The only problem is when the estimated hours are defined for the activity, but not for individual people. One way of doing this is splitting the hours between the people – in our case, there were 30 hours reserved for a Design Senior, so we split the total between two people with 15 hours each. Another way is to assign all the hours to one of the people, with the other being left with 0. That will, however, reflect negatively in the project reports, as the second person cannot generate any profit. The whole profit will be associated with the first person. If you make a deal with the client that something will be done for free, this activity should only generate expenses based on the time spent on it – no profit will be generated. Therefore, enter 0 hours and 0 hourly rate. Note: This is how internal projects are defined too, as they don’t have any budget by definition.